Floor Marking is a Necessary Measure in the 5S and Lean Manufacturing Philosophies. Any 5S Program will benefit from floor marking. Creating a visual work place involves a variety of tools and tips, but one of the easiest ways to create a more safe and organized work environment is with effective floor marking. OSHA and ANSI make color recommendations so it is easy for somoene who is not familiar with your facility's color scheme to make quick and educated decisions. If you go with a color system that does not follow these recommendations, you are required to make a char that lays out the colors you are using and what they mean, and it must be posted in a place where all employees are able to view it. To see a floor marking color code reference chart, fill out the request for our FREE Floor Marking Guide. The Floor Marking Guide is an informational guide to industrial floor marking. It may be helpful to see a sample floor marking layout before you begin marking the floors in your own facility. Our floor marking guide contains a sample layout to give you ideas and help with the floor marking process. 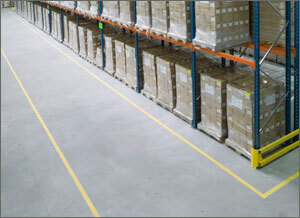 OSHA Regulations require that permanent aisles and passageways be marked. 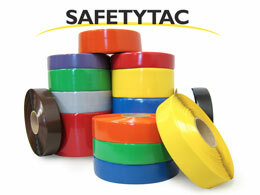 ANSI Z535.2 Safety Color Code designates yellow as the caution color to be used for marking physical hazards such as stumbling, falling or tripping points. Industrial Floor Marking Tapes are generally recognized as the most convenient and inexpensive way to mark aisles since painted lines tend to chip, peel and crack especially in areas with heavier traffic. The required minimum width for facility aisle and floor marking lines is 2". 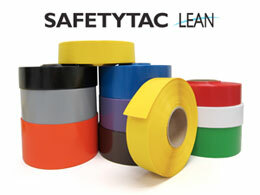 It is standard to use floor tapes between 2" and 6" wide, depending on the applications. Get your FREE FLOOR MARKING Guide for a comprehensive Floor Marking resource. Copyright © 2019 5SToday.com | All Rights Reserved.